Lulu has always found ways to reinvent herself as a performing artist, songwriter and entertainer - from TV variety show host to recording with David Bowie as producer and her 1993 return to the charts with Relight My Fire, a collaboration with Take That. In 2002 she returned to the UK charts with a cover of Bob Seger’s We’ve Got Tonight, a duet with The Voice Australia judge, Ronan Keating. 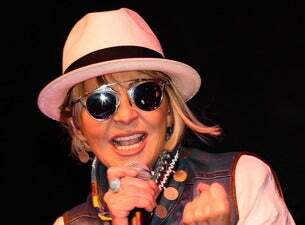 While ever-popular in the UK through touring, stage musicals and TV appearances including regular spots on Absolutely Fabulous, Lulu returned to the studio for the first time in 10 years for last year's Making Life Rhyme, mostly self-penned and acclaimed as one of the finest albums of her career. The album was followed by a string of sold-out dates in the UK and a storming set at Glastonbury alerted new generations that before there was Adele and Amy Winehouse, there was Lulu. Lulu was born in 1948 and raised, as Marie McDonald McLaughlin Lawrie, in a tough working-class part of Glasgow. She was first discovered as a schoolgirl singing in a band, with a mighty voice that was the opposite of her diminutive build. That drive led to her solo career and classics like her 1967 smash with the theme tune for To Sir, With Love. She made her acting debut in that film, a warm and wise exploration of issues such as racial discrimination and the class divide, with Lulu playing one of the young classmates to Sidney Poitier's brilliant performance as an idealistic teacher imparting life lessons in a London high school. She was just 20 when she married Maurice Gibb in 1969, the year she won the final of the Eurovision Song Contest with Boom-Bang-a-Bang. That year she recorded the New Routes album at the scene of many legendary soul music recordings, Muscle Shoals Studios in Alabama, with a crack band including Duane Allman on guitar and producers Jerry Wexler, Tom Dowd and Arif Mardin. The album included a fine version of the Bee Gees song Marley Purt Drive. Gibb and Lulu remained on good terms after their divorce, later performing on TV together. Lulu's 2015 UK tour included songs in tribute to the Bee Gees. In 1974, Lulu had a secret liaison with David Bowie, who produced her version of the Bowie classic The Man Who Sold The World, a top 10 hit in the UK. She was also learning from the best as a songwriter and in 1993 she wrote a worldwide hit for Tina Turner, I Don't Want To Fight. The song gave Lulu the title for her autobiography, published in 2002.